A new generation of smartphones with Full High Definition 1920x1080 displays have arrived, the same as your living room HDTV, but with a 5 inch screen size – that is very impressive! But, how good are these new displays, do you really need all of that sharpness and resolution, and will you be able to actually see the difference? Also, how do they compare with the Apple iPhone 5 and Samsung Galaxy S4? We’ll cover these issues and much more, with in-depth comprehensive display tests and analysis that you will find nowhere else. 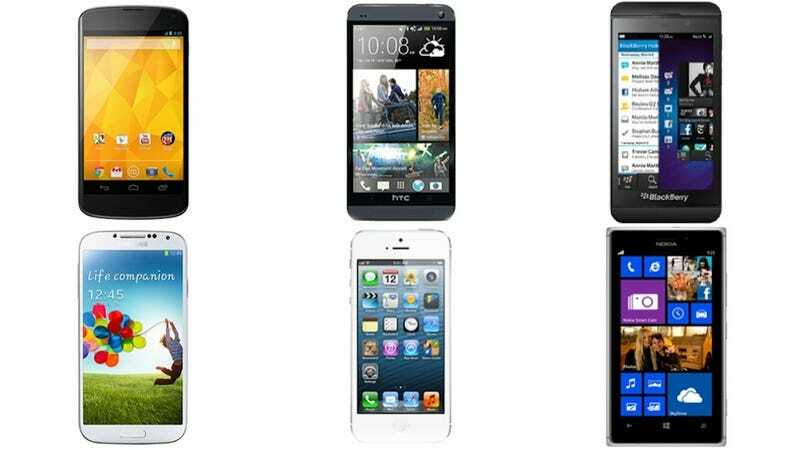 In this article we’ll examine three Flagship Full HD top-of-the-line smartphones: the HTC One, Huawei Ascend D2, and the Sony Xperia Z, all with 5.0 inch or smaller screens. The LG Optimus G Pro has an excellent Full HD display that we have tested (for SID Information Display magazine), but it’s currently available only in a larger 5.5 inch size – a smaller 5.0 inch model is coming, which we plan on including when it becomes available. While Huawei is better known as a manufacturer of low cost smartphones, their Ascend D2 is aimed at the premium top tier, and as you’ll see below, they managed to hit a home run with the display the first time at bat – that’s also very impressive! To examine the performance of these Flagship Full HD smartphone displays we ran our in-depth series of Mobile Display Technology Shoot-Out Lab tests. We take display quality very seriously and provide in-depth objective analysis side-by-side comparisons based on detailed laboratory measurements and extensive viewing tests with both test patterns and test images. To see how far smartphones have progressed in just three years see our 2010 smartphone Display Shoot-Out, and for a real history lesson see our original 2006 smartphone Display Shoot-Out. In this Results section we provide Highlights of the comprehensive Lab tests, measurements, and extensive side-by-side visual comparisons using test photos, test images, and test patterns that are presented in later sections. The Comparison Table in the following section summarizes the lab measurements in the following categories: Screen Reflections, Brightness and Contrast, Colors and Intensities, Viewing Angles, Display Power Consumption, Running Time on Battery. You can also skip the Highlights and go directly to the conclusions. Can You Actually See the Enhanced Full HD Sharpness and Resolution? Apple started a major revolution in display marketing by introducing their “Retina Display” with 326 Pixels Per Inch (PPI) on the iPhone 4 in 2010. While not equivalent to the resolution of the human retina, people with 20/20 Vision cannot resolve the individual pixels when the display is held at normal viewing distances of 10.5 inches or more. This started a PPI and Mega Pixel war similar to what happened with smartphone digital cameras, which is still an ongoing wild goose chase now into the stratosphere. Hopefully the same thing won’t happen with mobile displays. The real question is how high do we need to go before reaching a practical visual PPI limit? As I have pointed out before, the effective resolution of the human retina is much higher than Apple’s Retina Display, and corresponds to somewhere around 600 PPI at a 10 inch viewing distance, which is the limit for the best human vision, around 20/10. That is well above the highest 468 PPI display that we test here, so the Full HD higher resolution and sharpness should be apparent. On the other hand, very few people have that level of 20/10 visual acuity. In fact, a fair fraction of the adult population does not have corrected (near) vision even to 20/20. Furthermore, ambient light decreases visual acuity because the reflected light glare from the screen reduces image contrast – and smartphones are almost never viewed in the dark. So perhaps the extra sharpness won’t be apparent for many situations, especially casual viewing. But if you want (or need) to take advantage of that extra display sharpness and resolution, you can. If you study and stare at the image on the screen, move it closer, or move it around, you’ll be able to make out considerably more fine image detail because you are building an integrated visual image map in the brain. So, when you are looking at an image with finely detailed graphics and small text, most people with reasonably good vision will be able to make out and appreciate the extra sharpness and image detail if they take the time to do so. Unlike computer generated text and graphics that have precise pixel arrangements, photographic images are inherently fuzzy because the image detail is spread over multiple pixels, so you are less likely to detect a sharpness difference over basic 1280x720 HD, especially with jpeg images, which are all digitally compressed. That’s for still photos, but movies and videos have images that are continually changing so a fair amount of image detail is often visually lost due to its transitory nature (plus digital compression). So for photos, movies and videos the extra sharpness and resolution will be less apparent. From the above discussion, there are lots of good and technically sound reasons for moving up to Full HD in a 5 inch smartphone display. People with reasonably good vision will be able to see and appreciate the higher resolution, additional sharpness and image detail that it provides. In our Lab tests and measurements the three smartphone displays, for the most part, delivered comparable and very good to excellent performance, including Brightness, Contrast Ratio (low ambient light), Contrast Rating for High Ambient Light, Reflectance, White Point, and Display Power Efficiency, which are analyzed in the Comparison Table. Below are a number of major issues where the displays performed very differently. In order to produce accurate image colors on-screen the displays need to match the Standard Color Gamut that is used to create virtually all current consumer content, which is named sRGB / Rec.709 (not the occasionally mentioned NTSC Gamut, which was defined in 1953 and has been obsolete for over 30 years). The Standard Gamut encompasses digital camera, HDTV, Internet, and computer content, including virtually all photos and videos. Note that standard consumer content does not include colors outside of the Standard sRGB / Rec.709 Gamut, so a display with a wider Color Gamut cannot show colors that are not in the original, and only produce inaccurate exaggerated on-screen colors. Most LCDs until recently delivered only 55 to 65 percent of the sRGB / Rec.709 Color Gamut, but many newer smartphones are producing close to 100 percent of the Standard, including the HTC One and Huawei Ascend D2 tested here. However, the Sony Xperia Z has somewhat too large Color Gamut of 115 percent, which contributes to its many problems with color accuracy. The image brightness, contrast, and colors can vary significantly when the screen viewing angle changes by even ±30 degrees, which is quite common for smartphones because it depends on how you hold it in your hand (with varying pitch). The angle can be even larger if the smartphone is resting on a table or desk. While all LCDs show large decreases in brightness with viewing angle (generally over 50 percent at ±30 degrees), it is now unusual for high-end LCDs with In Plane Switching (IPS) or similar technology to show substantial color and contrast shifts with viewing angle, which were shockingly large on the Sony Xperia Z. The problem is incredibly large increases in the background Black Level with small changes in Viewing Angle, which significantly washes out and degrades the image contrast and colors. This could be an LCD technology issue or possibly due to the use of a low grade polarizer in the panel. To double check this, we tested another similar model, the Xperia ZL, and it showed the same substantial degradation with viewing angle. On the other hand, both the HTC One and Huawei Ascend D2 had excellent viewing angle performance, with no visible color shifts. This Figure with screen shots illustrates the Viewing Angle performance for the three tested smartphone displays. Picture quality and Color Accuracy are especially important for these Full HD 5 inch displays because they are multimedia devices designed for viewing photos, videos, movies, HDTV and internet content. It takes careful display hardware design and careful factory calibration to produce top notch picture quality and color accuracy. Some manufacturers attempt to make their displays standout with image processing “enhancements” that exaggerate the colors and image contrast. The result is almost always distorted and over saturated colors and contrast. It’s almost impossible to get the image processing “enhancements” to work well because of the incredible range and variety of images that can be displayed. The Huawei Ascend D2 avoids this sort of image processing and simply relies on standard accurate display calibration. Unfortunately, both the HTC One and Sony Xperia Z use excessive processing that results in distorted and over saturated colors and contrast. Not surprisingly, all three displays were extremely sharp, and had bright screens with good image contrast, but only at zero degrees Viewing Angle for the Sony Xperia Z, which has large color and image contrast shifts with Viewing Angle as described above. Where all three displays diverged significantly was in their Color Accuracy and Calibration due to excessive image and color processing, which some manufacturers do intentionally to try to make their displays stand out. But the end result almost always produces distorted and over saturated colors and contrast as described above. In our extensive Viewing Tests with a large set of challenging test photos and test images the three smartphone displays were incredibly different as we compared them side-by-side to each other and to a number of accurate calibrated displays. The Huawei Ascend D2 delivered every bit as good picture quality and color accuracy as the iPhone 5 and Galaxy S4, but the HTC One had noticeably and significantly inaccurate, distorted and over saturated colors and contrast. The Sony Xperia Z was significantly worse with its “Bravia Engine” On – turning it Off improved its picture quality a lot, but not enough. It is surprisingly difficult to capture the magnitude of the differences seen live using camera screen shots. We’ve often used the following photo of a colorful barn door. This Figure with screen shots illustrates the differences in Viewing Test performance for the three smartphone displays. When viewed live side-by-side the differences between displays appear much greater. While it has an excellent LCD panel (made by Sharp), HTC has significantly degraded display performance by introducing unnecessary image and color processing in a poorly implemented attempt at making the display stand out. The result is distorted and over saturated colors and contrast. And unlike Sony, HTC doesn’t provide an option to turn this processing off, which is a shame. Hopefully, such an option will become available in a future software upgrade. With the Ascend D2 Huawei appears to have taken the same successful solid approach for display performance as Apple. In our extensive side-by-side viewing test comparisons the Ascend D2 was virtually indistinguishable from the iPhone 5 and iPad Retina Display, two of the most accurate and high quality mobile displays we have ever tested. The Huawei Ascend D2 joins an elite group of smartphones with world class displays. The performance of the Sony Xperia Z flagship top-of-the-line smartphone can only be described as extremely disappointing. First of all, the Xperia Z has awful viewing angle performance, which is common for low-end low-technology displays, but is inexcusable in an expensive flagship top-of-the-line product. Second, the “Bravia Engine” that they brag enhances picture quality instead significantly degrades it, introducing extremely gaudy, oversaturated and distorted colors – similar to what you’ll see if you turn the Color Control on your HDTV all the way up to maximum. At least they provide an option to turn the Bravia Engine Off, which improves things a lot, but not enough. The Apple iPhone 5 is now more than half way through its product cycle, which is important to keep in mind for our comparison. However, the primary differences come down to its much smaller Screen Size (4.0 versus 4.7 to 5.0 inches), much lower Pixel Resolution (1136x640 versus 1920x1080), much lower total number of Pixels (0.7 versus 2.1 Mega Pixels), and much lower Pixels Per Inch (326 versus 443 to 468). On the plus side, the iPhone 5 has a much higher Peak Brightness (556 versus 421 to 491 cd/m2), a much lower Screen Reflectance (4.5 versus 5.6 to 6.5 percent), a much higher Contrast Rating for High Ambient Light (121 versus 65 to 88), and therefore much better screen visibility in high ambient light. All are major plus and minus differences. But the most interesting and significant development is that one of the Full HD smartphones that we tested here, the Huawei Ascend D2, delivers every bit as good a picture quality and color accuracy as the iPhone 5 (but at a much higher resolution and screen size). In fact, in side-by-side viewing tests the two are almost indistinguishable because they both have accurately calibrated displays, which makes it a tie in picture quality, unlike the HTC One and Sony Xperia Z, which are one or two steps below. The Samsung Galaxy S4 is another important milestone display that we tested in a recent Shoot-Out article. Because OLED technology is significantly different from LCD technology there are many subtle performance issues that are examined in that article. The two most significant differences are: OLEDs provide perfect blacks but LCDs are currently significantly brighter. However, the Galaxy S4 has a much lower Screen Reflectance (4.4 versus 5.6 to 6.5 percent), and as a result, a somewhat higher Contrast Rating for High Ambient Light (65 to 108 versus 65 to 88). The Galaxy S4 also provides multiple Color Gamuts, including one that is very accurate, another for professional photography, and a larger one that is better in high ambient light. In terms of image sharpness, the Galaxy S4 also has Full HD 1920x1080 resolution – but there is one important difference, the LCD displays have 3 sub-pixels per pixel while the Galaxy S4 has a PenTile structure with only 2 sub-pixels per pixel. However, the very high 312 to 441 Sub-Pixels Per Inch together with its advanced sub-pixel rendering still results in a very visually sharp display. In the end, they each have their own particular strengths and weaknesses, so for the time being, it remains a tie between these high-end LCDs and OLEDs. It’s amazing to hold a beautiful Full HD 1920x1080 mobile computer display and HDTV in the palm of your hand. But only one of the smartphones tested here qualifies as a beautiful display – the Huawei Ascend D2, because it delivers superior picture quality with accurate colors and images. This Figure with screen shots illustrates the major points we make in the conclusion. With the Ascend D2 Huawei appears to have taken the same successful solid approach for display performance as Apple. In our extensive side-by-side viewing test comparisons the Ascend D2 was virtually indistinguishable from the iPhone 5 and iPad Retina Display, two of the most accurate and high quality mobile displays we have ever tested. The Huawei Ascend D2 joins an elite group of smartphones with world class displays. While Huawei is better known as a manufacturer of low cost smartphones, their Ascend D2 is aimed at the premium top tier, so they managed to hit a home run with the display the first time at bat. My suggestion for Huawei, please keep it up. I was expecting a lot better from the HTC One. While it has an excellent LCD panel (made by Sharp), HTC has significantly degraded display performance by introducing unnecessary image and color processing in a poorly implemented attempt at making the display stand out. The result is distorted and over saturated colors and contrast. And unlike Sony, HTC doesn’t provide an option to turn this processing off, which is a shame. Please add that option in a future software upgrade. My suggestion to HTC, forget the display image processing tricks, which never work, and follow Apple and Huawei with solid and straightforward accurate display calibration. The performance of the Sony Xperia Z flagship top-of-the-line smartphone can only be described as extremely disappointing – even shocking, given that Sony was once the best display manufacturer in the world, famous for their beautiful and accurate picture quality – something they brag about on their Xperia Z web page – but is very far from reality for the Xperia Z. First of all, the Xperia Z has awful viewing angle performance, which is common for low-end low-technology displays, but is inexcusable in an expensive flagship top-of-the-line product. Second, the “Bravia Engine” that they brag enhances picture quality instead significantly degrades it, introducing extremely gaudy, oversaturated and distorted colors – similar to what you’ll see if you turn the Color Control on your HDTV all the way up to maximum. At least they provide an option to turn the Bravia Engine Off, which improves things a lot, but not enough. My suggestion to Sony, retrain your display engineering and marketing teams in the tradition of the former grand Sony Style. These are the trends in smartphone displays that we expect to see in the upcoming generation of displays. Smartphone cameras are still involved in an absurd Mega Pixel war, so I hope that both manufacturers and consumers can instead agree on sticking with Full HD 1920x1080 smartphone displays for a while. There are lots of good reasons to do so: there is a tremendous amount of Full HD 1920x1080 content available. Displaying that content at its native resolution (without the need to rescale up or down) results in the best possible image quality, plus rescaling requires processing overhead that uses (wastes) precious battery power. Screen sizes have been creeping up for years because of the marketing push to higher display resolutions. If we can stick with the 1920x1080 resolution then the increases in Pixels Per Inch can instead be used to begin decreasing screen sizes. Both HTC and LG have already started on this approach by introducing newer models that are smaller. The HTC One is 4.7 inches with 468 PPI that follows a 5.0 inch 440 PPI model. A 500 PPI Full HD display will be 4.4 inches, which may appeal to consumers that feel 5.0 inches is too large. All current displays perform poorly in ambient light because the reflected light glare progressively degrades the on-screen colors and image contrast. With improved sensors and color management, displays will be able to compensate for the effects of ambient light by dynamically changing the Color Gamuts and Intensity Scales to automatically correct for reflected glare and image wash out from ambient light. For those interested, I have an advanced article on this topic in the July/August 2013 issue of the SID Information Display magazine. Below we compare the displays on the HTC One, the Huawei Ascend D2, and the Sony Xperia Z based on a wide range of Laboratory measurement data and objective criteria. For additional background and information see the Flagship smartphone Display Technology Shoot-Out between the OLED Samsung Galaxy S4 and the LCD Apple iPhone 5. Dr. Raymond Soneira is President of DisplayMate Technologies Corporation of Amherst, New Hampshire, which produces video calibration, evaluation, and diagnostic products for consumers, technicians, and manufacturers. See www.displaymate.com. He is a research scientist with a career that spans physics, computer science, and television system design. Dr. Soneira obtained his Ph.D. in Theoretical Physics from Princeton University, spent 5 years as a Long-Term Member of the world famous Institute for Advanced Study in Princeton, another 5 years as a Principal Investigator in the Computer Systems Research Laboratory at AT&T Bell Laboratories, and has also designed, tested, and installed color television broadcast equipment for the CBS Television Network Engineering and Development Department. He has authored over 35 research articles in scientific journals in physics and computer science, including Scientific American. If you have any comments or questions about the article, you can contact him at dtso@displaymate.com. Galaxy S IV Display Shoot-Out: How Does It Compare? DisplayMate Technologies specializes in advanced mathematical display technology optimizations and precision analytical scientific display diagnostics and calibrations to deliver outstanding image and picture quality and accuracy – while increasing the effective visual Contrast Ratio of the display and producing a higher calibrated brightness than is achievable with traditional calibration methods. This also decreases display power requirements and increases the battery run time in mobile displays. This article is a lite version of our intensive scientific analysis of smartphone and mobile displays – before the benefits of our advanced mathematical DisplayMate Display Optimization Technology, which can correct or improve many of the deficiencies – including higher calibrated brightness, power efficiency, effective screen contrast, picture quality and color and gray scale accuracy under both bright and dim ambient light, and much more. Our advanced scientific optimizations can make lower cost panels look as good or better than more expensive higher performance displays. For more information on our technology see the Summary description of our Adaptive Variable Metric Display Optimizer AVDO. If you are a display or product manufacturer and want our expertise and technology to turn your display into a spectacular one to surpass your competition thenContact DisplayMate Technologies to learn more.